Ukraine saw a wave of rallies overnight Tuesday as a public response to the law enforcers’ move to detain 43 activists of the Donbas trade blockade at a staged a checkpoint at Kryvy Torets railway station in Donetsk region. TSN news service collected reports on the night protests from across Ukraine. 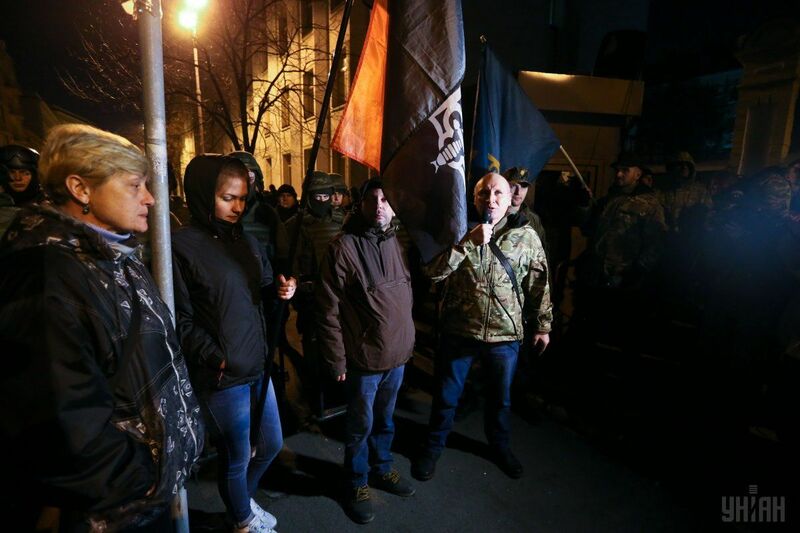 Several hundred protesters of a night rally on Kyiv's Maidan Nezalezhnosti, or Independence Square, in the early hours of Tuesday, March 14, demanded the release of detained protesters who oppose trade with occupied areas in Donbas. From the Maidan, the protesters moved toward the presidential administration and continued the rally there. However, the protest did not last long. There were actually more law enforcers present than activists. Protesters agreed to meet again on Maidan later on Tuesday. A more decisive protest was witnessed in Lutsk, where local activists announced the "seizure" of the building of the Volyn Regional State Administration (RSA). In fact, they have occupied the Oval Hall of the State Administration, telling they would not leave until the blockade detainees were released. They gave the law enforcers time until 10:00 Tuesday, March 14, otherwise threatening to use "other methods." Read alsoMPs: Detained supporters of Donbas blockade freed, left without money, documentsThe activists also demanded that Interior Minister Arsen Avakov be fired, as well as Deputy Head of the National Police and Head Donetsk region PD Vyacheslav Abroskin, and SBU chief Vasyl Hrytsak. In addition, supporters of the blockade demand that the law on "temporarily occupied territories" be adopted immediately. A bright protest was held in Vinnitsa. Outside the SBU regional office, the protesters set tires on fire, demanding the release of seven locals detained in Kryvy Torets. Activists vowed more protests in the morning outside the RSA headquarters as well as a blocking of Roshen factory if the detainees were not released until morning. The activists also said they opposed trade with the invaders. First deputy head of the regional SBU office talked to protesters assuring them that the detainees in Kryvy Torets had been released. In Chernivtsi, volunteers and activists gathered to protest against the dispersal of the blockade of the occupied areas of Donbas and to coordinate further joint actions. The main requirement is the convening of an extraordinary session of the regional council, so that the local government supported the position of the activists in preventing trade with terrorists, and also resolved the issues of ensuring energy independence. Outside the RSA headquarters, the activists also lit up tires in a protest against the dispersal of blockade participants. Having entered the Administration, they put forward the following requirements: to immediately call an extraordinary session of the regional council, to release the detainees, to pass a law banning trade with the occupied areas of Donbas, and to bring to justice those who ordered a crackdown on blockade participants. In Ivano-Frankivsk, the activists set old tires on fire, and fire trucks arrived within minutes to put the fire out. The protesters demanded the release of detained activists. Protesters in Lviv have met with RSA Chairman Oleh Syniutka along with the head of regional police department and local SBU office chief. They demanded that before 10:00 Tuesday, all detainees in Kryvy Torets be released, provided urgent medical treatment, and publish the list of detainees. In case mistreatment of protesters is confirmed, the activists demand to prosecute those responsible. The chairman of the Lviv Regional State Administration promised to contact President Petro Poroshenko shortly and forward the demands of Lviv activists. In Odesa, the protesters of Avtomaidan organization handed over to the Security Service demands of an immediate release of detained blockade participants, provision of urgent medical aid, and immediate investigation into illegal dispersal. If the demands of the activists are not met before 10:00 Tuesday, they pledged to resort to "other methods of peaceful protest." Kharkiv-based volunteers did not burn tires and did not "seize" the RSA. However, they signed an appeal to President of Ukraine Petro Poroshenko, the Verkhovna Rada, and the Cabinet, condemning the dispersal of the blockade activists. They demand the release of all detainees, an investigation into the actions of law enforcers during the dispersal, and justice to those responsible for violations. They also demanded to remove obstacles hindering access of medical staff, volunteers and journalists to the ATO zone, and also adopt legislation regarding the situation that emerged in connection with the occupation of part of the Ukrainian territory.